Congress president Sonia Gandhi flagged off the party's re-enactment of the Dandi March in Ahmedabad on March 12 to mark the 75th anniversary of Mahatma Gandhi's historic Salt Satyagraha. The Father of the Nation had undertaken the march to protest against the imposition of a salt tax on farmers by the British government. Over 79 workers from the Seva Dal, an organisation affiliated to the Congress, and 78 Congressmen from various parts of the country are participating in the 26-day march. 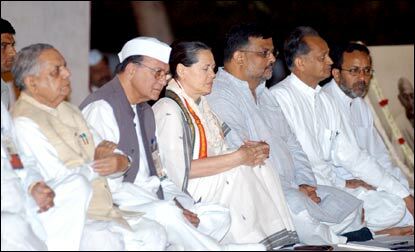 (From left) Gujarat Governor Nawal Kishore Sharma, Union Sports Minister Sunil Dutt, Sonia Gandhi, the Mahatma's great grandson Tushar Gandhi, former Rajasthan chief minister Ashok Gehlot and state Congress Legislature Party leader Arjun Modhvadia at the Sabarmati Ashram before the march commenced.